If you have been on one of our walks and would like to giveFeedback we’d love to hear from you. A fascinating tour of gardens in this area. Well worth visiting. A wonderful tour of modern gardens in the City. A very interesting tour of gardens in amongst the City’s modern buldings. Thoroughly recommended. Although grim visiting the burial ground, it was an enjoyable tour. 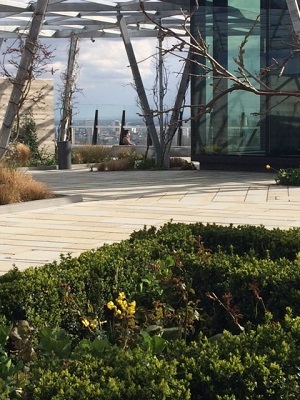 A new roof garden is now open at the top of the fifteen‐floor building at 120 Fenchurch Street, London EC3. It contains 79 wisteria trees, 5,000 bulbs and a 200 ft long recessed flowing water feature. The garden is open to the public. Entry is free and no booking is required.